Bhagoria Festival celebrated by Bheel tribal people at Jhabua and Alirajpur districts a week prior to Holi has been the amalgamation of modern elements and traditional landscape. 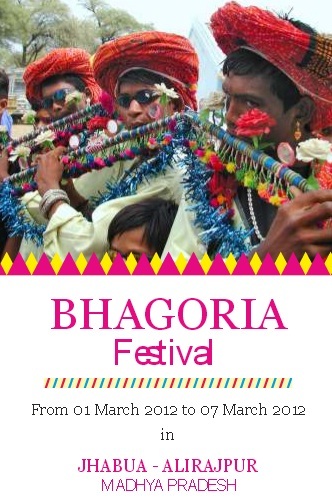 Bhagoria festival is one of festival during which young boys and girls are allowed to elope after choosing their partners for marriage. Bhagoria Haat Festival is organized in the district of West Nimar(Khargon) and Jhabua. The haat is organized in the form of a 'swayamvar' or a marriage market where young girls and boys are allowed to choose their partners. In our endevour to provide the true flavour of the colorful and vibrant land of border of Madhya Pradesh / Rajasthan/ Gujarat, Bhagoria festival, is a unique festival which speaks of the multicultural base of modern India. The Bhagoria Haat in Jhabua, Madhya Pradesh reminds us of the age old colorful traditions of the tribal, since this festival originated with the Bhil tribal of Madhya Pradesh. The fun filled nature of the festival is representative of the rich cultural heritage that India represents. The concept of the festival originates in the process of elopement seen from its nomenclature, of “bhaag”, which literally means “run” in Hindi. It is also something like the idea of “Swayambhara” where young partners elope, and are later sanctioned by the society predetermined by their customs. Usually the couple may have met before the fair several times, and hence the idea of eloping is rather a formalized process, more stylistic than real, and conforming to the laws of their traditional rules and regulations. Bhagoria Festival is celebrated in the month Phalguna(February-March).The festival falls before Holi, another major Indian festival, and is also associated with agricultural harvest and fertility.